I am just over the moon excited that Spring has made its appearance! With the birds chirping and the blue skies shining… it was time to make an Easter wreath… a Robin’s Egg Blue Easter Wreath to be exact! The first thing you will do is spray paint your eggs. I chose this pretty blue from Rustoleum. Let that coat dry and then turn them over and spray the other side. 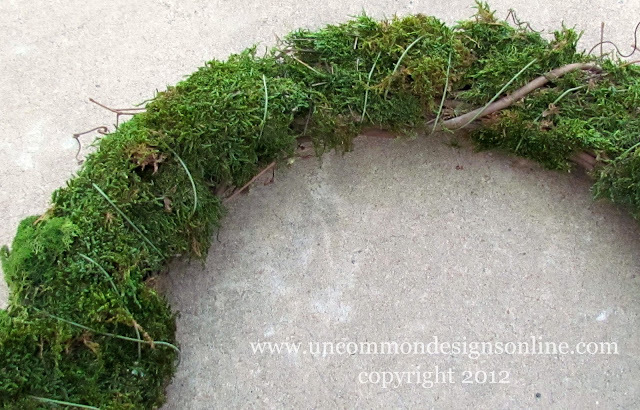 Now it is time to adhere the moss to the grapevine wreath. I used a preserved bright green sheet moss. First, I took a small area of the moss and get as much dirt off as I could. Then, I laid it on the wreath and literally wired it on. It doesn’t have to be perfect, just cover the front of the wreath! This is the most time consuming part of the process. You will hot glue the eggs onto the wreath form. Again, we are not going for perfection here, just coverage! About nine million glue sticks later… I speckled the eggs with brown acrylic craft paint. You can spatter paint them or you can flick the bristles of a toothbrush to get a light spritz. Now if you are not crazy OCD over the teeny tiny details you can skip this part! I took a little bit of reindeer moss and would glue little tufts where there were spaces between the eggs. Polished and Pretty? … absolutely! Add your pretty bow and you are done! See you tonight at the Uncommonly Yours Link Party! I love this wreath!! The robin’s egg blue is such a pretty color & that little burlap bow is the perfect touch! Beautiful job! I LOVE this wreath! I have that same blue spray paint! 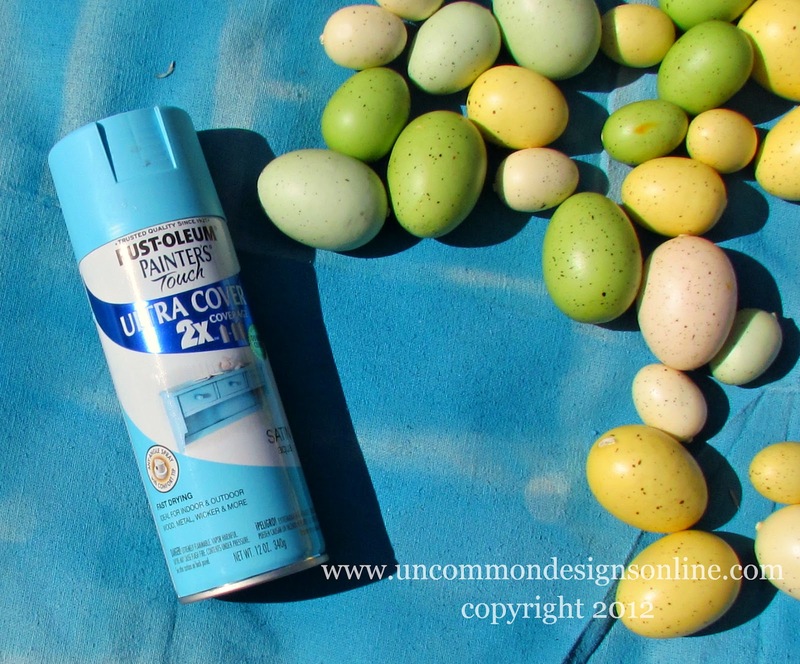 I have got to keep my eyes out for little eggs though, I wonder if you could spray paint plastic ones. Anyway, it turned out awesome! What a pretty welcoming wreath! Very pretty and a great way to usher in spring! This is super cute. I’ve been wanting an egg wreath for a long time and this one is perfect! Thanks for sharing!! I LOVE this wreath! I’ve been looking for an easter wreath that isn’t too cheesy. Thanks for sharing! I use that color all the time and I just love it! It looks so fabulous on that wreath! I just love this wreath. I usually don’t decorate for Easter. I am not sure why, but this wreath has inspired me to maybe put a little something up! Great job! I saw you at Funky Polkadot Giraffe. So cute! I love the touch of the burlap bow. Amazing! Thanks for sharing at oopsey daisy! Beautiful wreath! 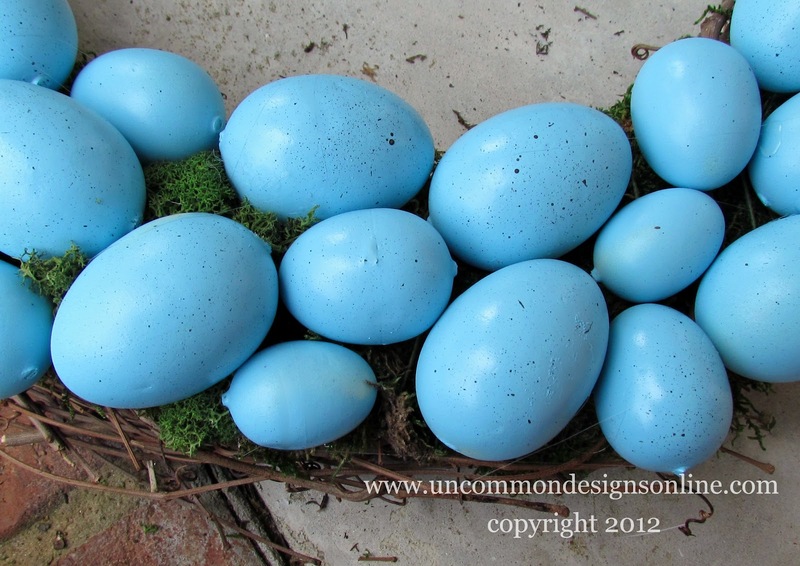 I love the color of the moss mixed with the robin blue eggs. One question – how did you get all of those linky parties in the neat order that you did? Wow, this is gorgeous! Lovin’ the blue eggs. thanks for the tutorial! LOVE IT!!!!!!! The blue is just perfect!! Love this! I would also put the fill the little space between the eggs! This is sooooo pretty! I would be thrilled to have you share this at my party going on right now! This is such a pretty wreath! Came over from Live, Laugh, Rowe – I LOVE this!!! Very springy – the colors are beautiful and I just love the moss look! I found your page through your link up to the sasse life crafty sasse Wednesday & I just love this wreath! Thanks so much for sharing! I just happen to have the exact same color of spray paint that I’ve been waiting to use :). I’m a new follower, love your blog! ARe those eggs edible? They should be. They look like they would be malted milk…mmmm! Thanks for linking up at the Stinky Linky party, you made my night! Oh that is SO cute and I love the vibrant blue! Looks great on the door. Yum! Love it. Wow, that is gorgeous. The colours are stunning! This is beautiful!! I love it!! Such a fun idea for Easter! Thanks for sharing at Thursday’s Temptation. Loving the diy wreath. Its so bright and beautiful. Wow, it is beautiful and I love the finishing touch of the burlap bow! Thanks for sharing at Simply Klassic Sunday! That’s gorgeous! I really need to get moving on my spring wreath and I think I might actually have all these supplies already (not really surprising if you could see the mess that I call a craft room!) Thanks for sharing at my party! I’m loving this wreath! I need to start my spring decor and this would be perfect. I would love it if you would share this at Fabulous Friday! Wow! That turned out beautiful. Visiting from Serenity Now. Tonight our linky party “Cowgirl Up!” goes live. It is a linked linky, so post once and your link appears on four blogs. Hope to see you and your cute wreath tonight! I absolutely love this! So much that I featured it today at Southern Lovely. Thanks for sharing at Show & Share! 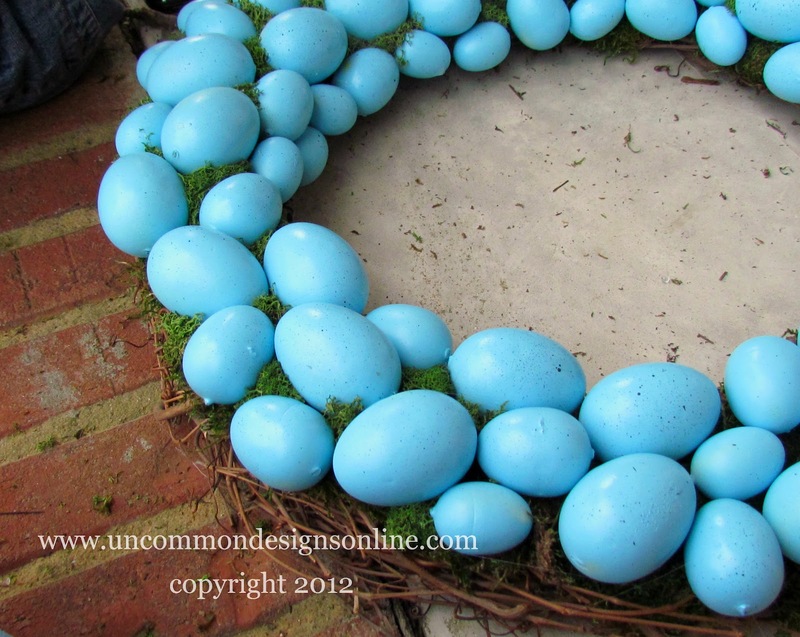 Love your wreath – the blue of Robin’s eggs has to be one of my favorite colors!!! Happy Easter! Beautiful wreath, love the blue color you chose. I’ve been wanting to make one but am overwhelmed with all the spring painting going on in my house. Thanks for showing us how! Thanks for sharing your creative inspiration at Sunday’s Best. Thanks so much for linking up your two projects! I LOVE this wreath. I still need to get my spring wreath made and this is such a cute one! LOVE it! New GFC follower stopping by from the toot your horn Tuesday hop. I co-host the Creative Corner Hop every Monday. Feel free to come and link up. It is open all week. Yippee!! I have found my spring wreath! Thanks for the inspiration!! I can’t wait to try it!! Your wreath is so beautiful and I think everyone should be OCD about the space in between because yours is AMAZING!! I love the blue eggs as well. Your attention to detail is great 🙂 Came by from Toot Your Horn! New Follower!! Gorgeous wreath! Love the pop of the blue eggs! Just adore the Spring wreath. How can I come to the party. Still haven’t caught on to this linky stuff. Thanks so much for linking up to Pinned it, Made it #10! I featured your awesome wreath 🙂 Drop by and grab a button. I love this! Very classy. This wreath is so cool! I really really like the bright blue eggs. I’d love for you to come share at my first linky party! Pinning this! Just gorgeous! Thank you so much for sharing at Mom On Timeout! I love this wreath. I love the color you chose to paint the eggs. Thanks for sharing. I would love if you could link this up to our linky party going on right now. Sooo much prettier than the plastic egg wrreatyhs (IMHO) – I just love it! The color would really pop on my red door too! Will try after ‘Snacks” birthday party this Saturday! You’re being featured tonight – thanks so much for sharing! linked back to your post…really love the wreath! Oh my gosh! I love your wreath! I saw you over on 52 mantels! The eggs on your wreath are the color of my front door so I would have to paint the eggs a different color. I may try making a wreath like this. I love it! Totally cute! Beautiful wreath-love it! Following you from Kate’s party-stop by for a visit! It’s just so fabulous!! I’m so honored that you linked up to my party!! I’ll be featuring you tomorrow at Mop It Up Mondays! Thanks for linking up! I’m featuring this wreath at the Cowgirl Up! linky party tonight! Come check it out and grab a featured button. Beautiful wreath! Lovely wreath! Very pretty. I found you on Rhoda’s Southern Hospitality blog and I am a new follower. I see that you are going to Haven also! Looking forward to meeting you there. Gorgeous wreath! It is perfect for spring! Love this so much Trish! the blue is so gorgeous! Just shared on our Facebook Page, we’re featuring projects from the Bunny Blog Hop! Thanks for sharing it with us! I’ve been seeing your wreath featured and had to come tell you that it is absolutely beautiful!!!!!!!! 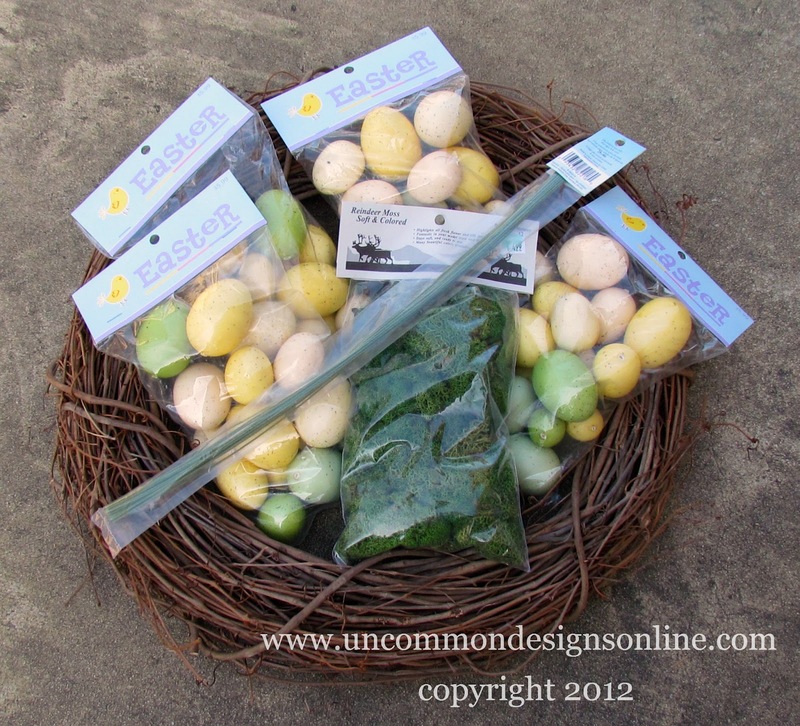 The blue eggs with the green moss and the burlap bow…ahhh to die for! Love it! This is great! I’ve bookmarked it so I can try it! So pretty! 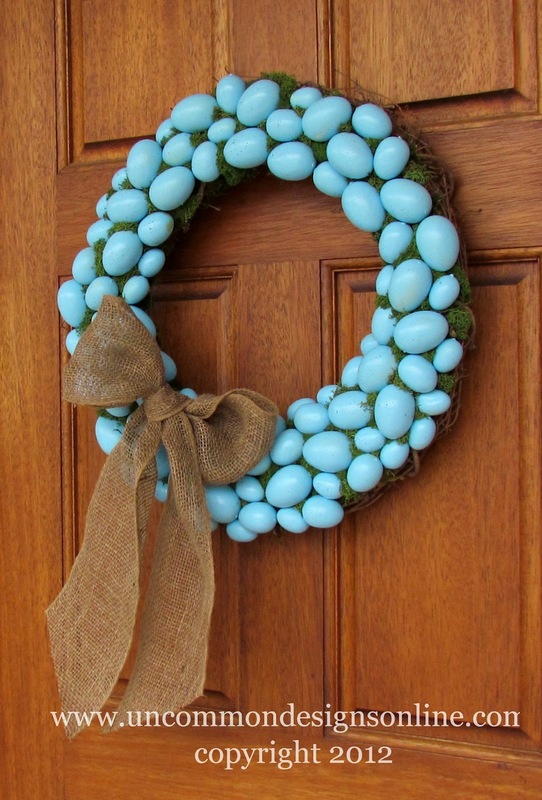 I adore those blue eggs and this is such a lovely wreath. Thanks for sharing this project! This wreath is awesome! I’m very tempted to try it. I’m not a crafty person, but this really appeals to me. I’d love to pin this wreath to The Home Depot’s Wreaths For Every Occassion Pinterest board if you don’t mind! This is so pretty ~ I really like the blue eggs against the green. Thanks for sharing the step by step, too! I found you today thru the Domestically-Speaking, Countdown To Spring Linky Party, where I’m #108. I hope you get a chance to stop by my blog and leave a comment, too! I am featuring this wreath in this week’s Friday Favorites. Love this idea for Easter. This is one gorgeous wreath. I’ll be saving this idea for next Easter.